S. J. Morden’s 2018 One Way is an SF murder mystery. Frank will still serve out his life sentence, but he can spend it doing something visionary on Mars. Xenosystems Operations has a contract to build the first crewed base on Mars. Frank’s background in construction has given him skills directly applicable to the project. His status as a lifer means that said skills are available to Xenosystems for a mere fraction of what they would have cost before Frank was convicted. Accompanying Frank to Mars will be Marcy, Declan, Alice, Dee, Zero, and Zeus; there’s also a company man nominally in charge of the crew of convicts. Like Frank, all the work crew are lifers. Also like Frank, each of them has skills that will make them valuable on Mars. All are highly motivated to see the project succeed, since if they wash out on Earth they will be consigned to life in solitary to maintain project confidentiality. If they screw up on Mars, they will die. Mars is a dangerous place. Marcy is the first to die, victim of a suit failure. Next to go is Alice, the team doctor; all the evidence points to suicide. Zeus is third to die, victim of depressurization. Nobody said life on Mars would be a long life on Mars. When Frank tries to figure out how the fatal accident occurred, he discovers something ominous. There was no way for the depressurization to have happened by accident. Zeus was murdered. Which means that Marcy and Alice might have been killed as well. The next death makes it clear that the killer isn’t finished. What isn’t clear is which of Frank’s companions is responsible. After all, with the exception of Brack, the company man, all are convicts. All have blood on their hands. Frank also realizes that he may find it difficult to convince his fellow workers that he is not the killer. After all, he’s a murderer too. It’s not clear what purpose the base on Mars is supposed to serve, but that’s NASA’s problem. Xenosystems Operations has a very clear goal; create a facility on Mars and do it on time and on budget. While non-Americans might find the corp’s use of prisoners indistinguishable from slavery, involuntary labour is a fervently held tradition in the US. And it’s very cheap. Obligations to shareholders take precedence over basic human decency. When trapped in an isolated location with one or more killers and no professional detectives, there are two ways to work out who is killing whom. The first is for some bright amateur to gather all the evidence and eliminate the false leads before pinning the blame on the culprit. The second is to bide one’s time until only the killer is left. The second method is absolutely reliable, while the first places a lot of pressure on someone who is by definition an amateur. Still, prospective murder victims seem to prefer the first approach. It takes Frank longer to work out what’s going on than it may take experienced mystery readers; I mentioned the set up to a friend who immediately commented [rot13 for spoiler]Ohexr, Pnegre W. In Frank’s defense, there’s no evidence he has ever had any interest in crime solving; the pusher he killed wasn’t hiding his business (except from the cops, or at least the honest ones). This is a perfectly cromulent mystery of type [assortment of strangers in an isolated location]. Indeed, the setup makes sense, which is not the case for many such mysteries. Of course everyone is suspect; they are murderers. Of course they are isolated; they are on Mars. As for getting away with it … who’s going to send a cop to Mars to arrest the sole survivor aka the actual murderer? Another touch that pleased me: Morden gives us a cast who are flawed but also sympathetic. Readers will care as the explorers dwindle in numbers. And there’s the exotic location: a radiation-soaked, airless world where death is a single mishap or oversight away. All the fun of The Martian, with extra added murder goodness. 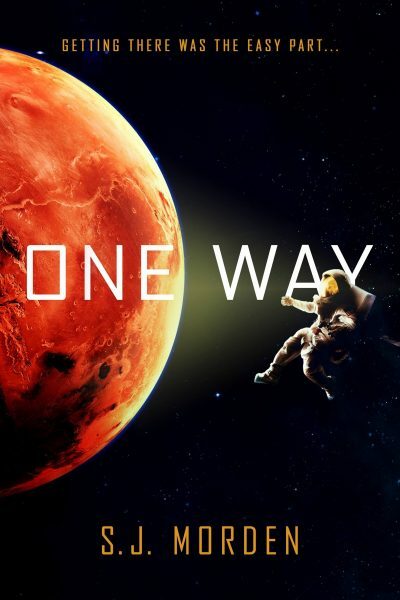 One Way is available here (Amazon) and here (Chapters-Indigo). "As for getting away with it … who’s going to send a cop to Mars to arrest the sole survivor aka the actual murderer?" And let us not forget that said sole survivor will be in the position every Paranoia character would like to be in after a mission: "I feel I can say, without fear of contradiction, that...."